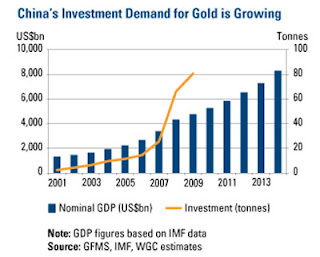 China is now outstripping India when it comes to buying gold. "China produced 340 metric tons of gold last year and consumption was about 700 tons, leaving a gap of 350 tons to 360 tons." Said Albert Cheng, Far East managing director of the council recently. "...China's investment demand jumped 123 percent to 90.9 tons in the first three months, compared with an 8 percent rise to 85.6 tons for India." As can be seen from the accompanying chart, since 2001 China's demand for gold has jumped from zero to over 150 metric tones last year, and this year looks set to increase on that. China is indeed buying gold with a vengeance. "Gold has taken on a new role in China amid concern about inflation," Song Qing, a director at Lion Fund Management Co., said. "It is increasingly being seen as an asset allocation choice. Just imagine the total wealth in China and even a small percentage of that choosing to buy gold. This demand is going to be enormous." Both the central banks, as well as citizens, are buying gold and not just bars and coins. As wages increase gold jewellery is now at the top of many shopping lists. China, which has just 1.6 percent of its reserves in gold, may invest more than $1 trillion in bullion, [Michael Pento of Euro Pacific Capital] said. "China wants to be an international player, and they need to own more gold than they currently have." "China is out to have more gold than America, and Russia is aspiring to the same," Robert McEwen, the chief executive officer of producer U.S. Gold Corp, recently pointed out in an interview in New York. "When you have debt, you don't have a lot of flexibility. China wants to show its currency has more backing than the U.S."
Century Weekly reported this week that China, with more than $3 trillion in foreign-currency reserves, plans to set up new funds to invest in precious metals. Russia also purchased 8 tons of gold in the first quarter this year. So China is not the only large investor deciding to invest in gold, India continues to buy gold on a massive scale. The World Gold Council reports that Argentina bought 42 tons of gold bullion recently, possibly to starve off potential future woes of inflation and crushing debt. Others include Belgium, Austria, Spain, and Lebanon among many others. When you find countries buying gold as security in inflationary times you know that something is afoot. This is one time when it is a good idea to jump on the band wagon and buy some gold oneself.